It is just over five years since the Lad and I went to see Turin Brakes at the Academy in Bristol as the Lads first live gig. I have held a special place for TB since their first album The Optimist. Back around 2005 they were heralded as part of the then new folk/acoustic revival, but it is a burden to be tagged to any particular ‘wave’, and in some respects the indie band period took the sheen from TB’s star. Outbursts is the fifth TB album and was paid for I believe from the royalties accrued from a Take That track that the chaps wrote. Given my allegiances I felt curiously disloyal to feel the album a disappointment. On first plays only the opening and closing tracks seemed to have the old TB magic, the whole feeling a bit downbeat, a little careworn and weary. 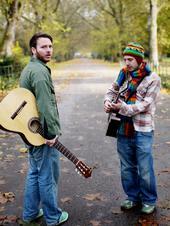 Sea Change – ascent of man from Turin Brakes on Vimeo. This entry was posted in Uncategorized and tagged Turin Brakes, video. Bookmark the permalink.